A SpaceX-owned Dragon cargo craft left the International Space Station on Friday and flew back to Earth for a parachute-assisted splashdown in the Pacific Ocean with a dozen mice and more than 3,000 pounds of experiment specimens and space hardware. The homecoming concluded a 37-day stay by the Dragon spacecraft at the orbiting research lab. The unpiloted supply ship launched from Cape Canaveral on July 18 and arrived at the station two days later. 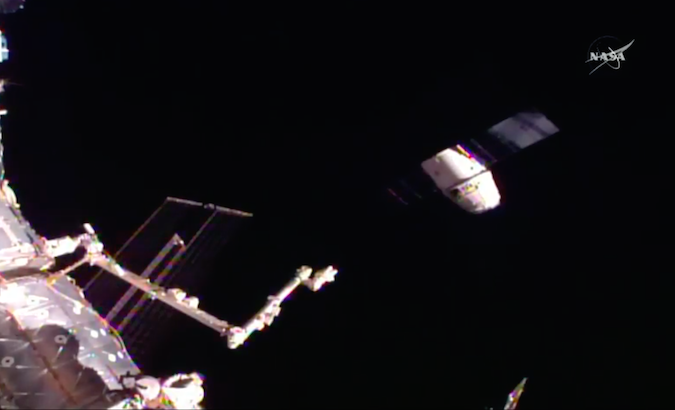 Astronauts Kate Rubins and Takuya Onishi took control of the space station’s robotic arm to release the Dragon cargo capsule at 6:11 a.m. EDT (1011 GMT) as the complex sailed 251 miles over the Timor Sea north of Australia. “Houston, station, on Space-to-Ground Two, Dragon depart successfully commanded,” Rubins radioed mission control. The Dragon delivered a Boeing-built docking adapter to the outpost, and astronauts Jeff Williams and Rubins installed the new spaceship parking port Aug. 19. The adapter is one of two new docking ports to be added to the space station for arrivals of new U.S. commercial crew capsules. Flying the ninth of at least 26 cargo missions assigned to SpaceX — and the company’s eighth successful logistics flight — the Dragon supply freighter ferried 4,976 pounds (2,257 kilograms) of provisions, experiments and other equipment to the space station, including the new docking adapter launched in the cargo craft’s unpressurized trunk. A handheld device to sequence DNA in space for the first time was among the cargo flown to the space station last month, along with investigations in stem cell research, the effects of space travel on the human heart, and the performance of a new type of heat exchanger that could be used on future spacecraft. The DNA sequencer is of special interest to Rubins, who was an infectious disease researcher in the field before her selection as a NASA astronaut. “We’re trying to understand can we even use this technology off-world because it’s very dependent on fluids, surface tension and bubbles,” she told ABC News in an interview earlier this week. “So we’re doing a lot on the technical development side of things to see what we can do off the planet in terms of modern molecular biology. Scientists also hope the device will help identify and track micro-organisms who inadvertently accompany astronauts to the space station and begin living there. The Dragon spaceship is one of four cargo vehicles currently flying to the space station, but it is the only craft capable of returning significant mass to Earth. That is vital to scientists who want to manually examine specimens from their experiments, and for engineers eager to troubleshoot and repair faulty equipment that could be launched again to the space station on a later mission. The space station’s other cargo craft — Orbital ATK’s Cygnus, Russia’s Progress and Japan’s HTV — all burn up during re-entry. Despite their destructive return, they still serve important roles to dispose of the space station’s trash. Blood and urine samples collected from the space station astronauts were stored in freezers plugged in inside the Dragon capsule, and 12 mice from an experiment sponsored by the Japan Aerospace Exploration Agency also returned Friday. The male mice launched aboard the spaceship July 18 for a genetic research investigation. Japanese scientists will remove their internal organs and harvest their sperm cells once the mice are back on Earth, then use the sperm to fertilize new mouse embryos. Researchers want to learn how long-term spaceflight causes changes to gene expression and epigenetic modification, with an eye toward cataloging the effects of space travel on offspring and future generations. Friday’s re-entry was the first time live mice have returned inside a Dragon spacecraft. The SpaceX cargo ship also brought home a spacesuit for inspection. 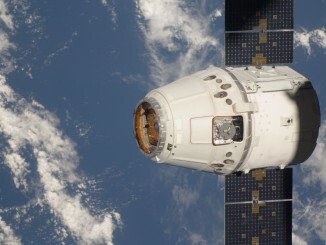 A NASA spokesperson said the Dragon’s cargo load for Friday’s landing totaled 3,410 pounds, or 1,547 kilograms. Astronauts closed hatches between the Dragon spacecraft and the space station’s Harmony module on Thursday, then ground controllers removed the cargo craft from its berthing port with Canadian-built robotic arm operated via remote control. 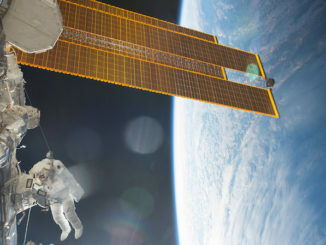 Rubins and Onishi operated the arm from a control station in the space station’s cupola for Dragon’s departure. The Dragon’s Draco maneuvering thrusters conducted three burns to depart the vicinity of the space station, then the craft was scheduled to close and latch the door to its navigation bay before setting up for a de-orbit burn at 10:56 a.m. EDT (1456 GMT). The spaceship jettisoned its unpressurized trunk section and solar panels a few minutes later to burn up in the atmosphere, while the main module re-entered cocooned inside a specialized ablative heat shield developed by NASA and SpaceX to withstand temperatures reaching up to 3,000 degrees Fahrenheit on its hypersonic approach to a landing zone 326 miles (525 kilometers) off the coast of Baja California. 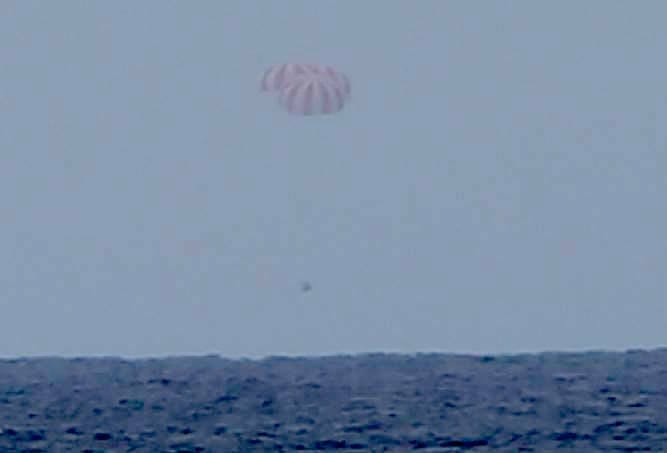 Dual drogue parachutes deployed when the capsule passed an altitude of about 45,000 feet, then three 116-foot-diameter (35-meter) main chutes opened to slow down the craft’s descent to a gentle 10 mph for splashdown at 11:47 a.m. EDT (1547 GMT). A maritime recovery team on standby in the Pacific will approach the craft, hoist it onto a boat, and ferry it back to port in Long Beach, California, where SpaceX will hand over time-sensitive samples to NASA for delivery to science teams around the world. The Dragon capsule will go to SpaceX’s test facility in Central Texas for inspections, decommissioning and potential refurbishment for another flight. SpaceX and NASA officials said last month that a previously-flown Dragon spacecraft could launch again on a cargo flight to the space station next year, possibly as soon as the 11th Dragon resupply flight scheduled in early 2017. SpaceX currently flies newly-built Dragon capsules.